I’m not arty. Let’s just get that out there. Creative, yes, in terms of writing. But artistic ability? Put it this way, my three year old can draw better stick figures than me. But an important part of PND recovery is self-care and one of the self-care activities I found myself drawn to (excuse the pun) was adult colouring, and watching You Tube videos. One thing led to another and soon I was watching You Tube videos about adult colouring and then about craft, specifically card making. Since then I’ve become a little obsessed and begun to build up my stash of craft supplies. Thankfully, you don’t have to actually spend a great deal to build up your stamping and paper supplies, especially since the popularity of paper-craft seems to be continually growing. More than anything I just find card making to be incredibly soothing and therapeutic. As I mentioned earlier this week, having a creative outlet can really improve your emotional health – especially as a mum when time for yourself can be scarce. 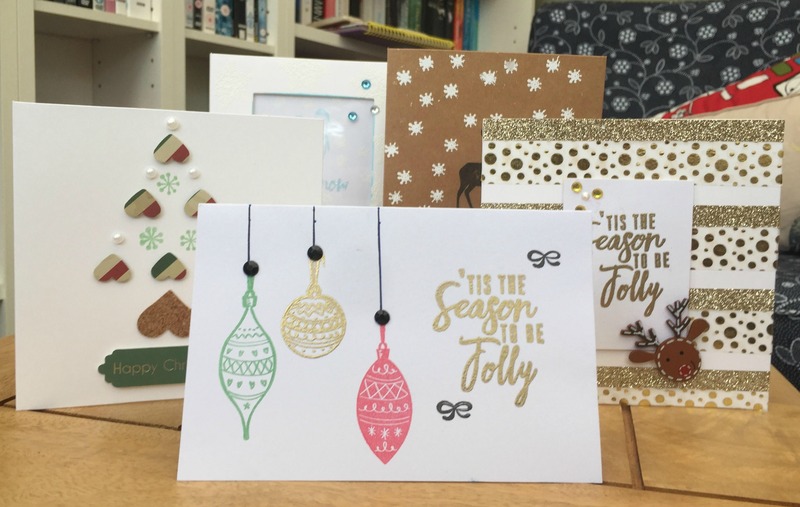 I’m sharing below a handful of the Christmas cards I’ve made this year, including their many imperfections, to show that you don’t have to be particularly talented to still have a lot of fun with card craft (all supplies listed at the end of this post). Creating fun backgrounds with coloured and patterned tape is really easy and fun. There are so many patterns and widths available and it really makes an impact. 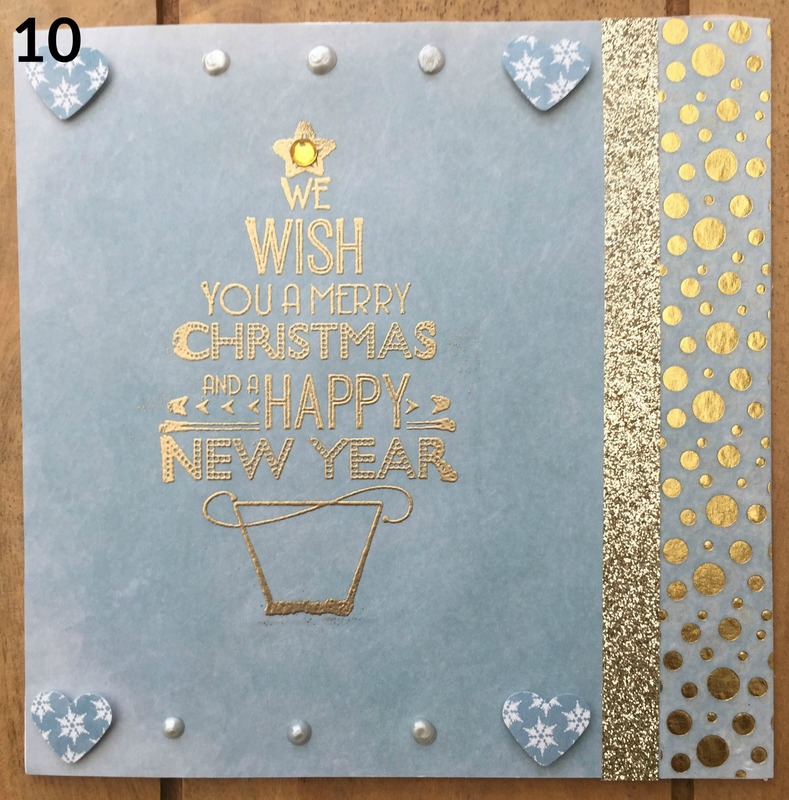 I created this background using this glitter tape pack from The Works, then added the pre-made ‘Warmest Wishes’ topper for ease. 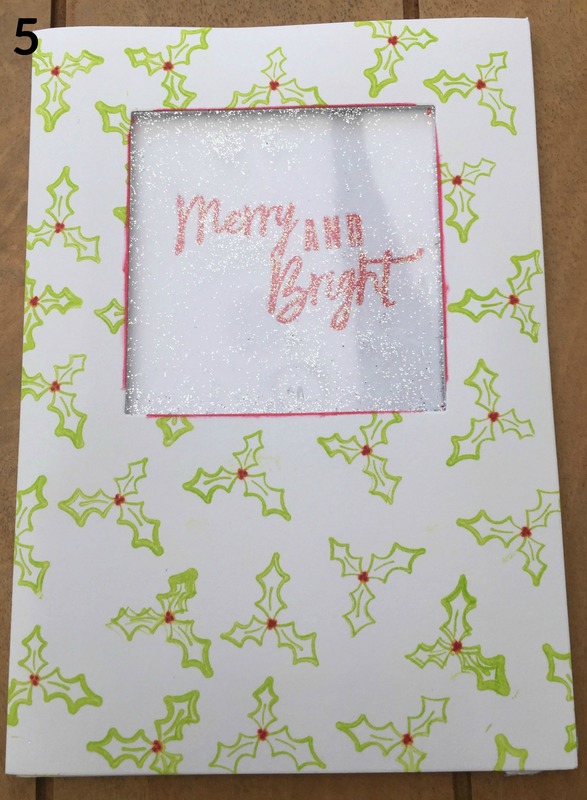 I created the central embellishment by stamping the baubles from this clear stamp set in an overlapping pattern (I did this by masking off the centre image to make it appear to be in front of the others) and cutting out when finished. The central bauble is silver embossed. Embossing is my favourite part of card making. You simply stamp an image using a special clear, sticky ink and tip the powder on top, tapping off the excess. Then melt the powder with a special (but inexpensive) heat tool to create the glossy, glittery or metallic finish. I attached the bauble image with foam tape for a bit of dimension. Here I used patterned paper in a subtle colour to create a snowy ground for my reindeer stamped image. 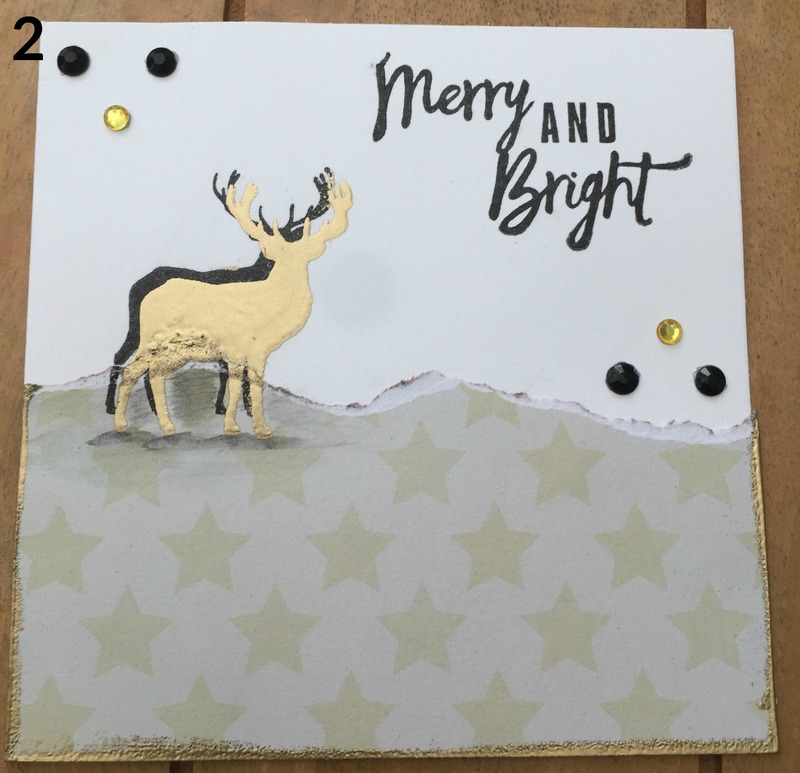 I stamped the deer twice – once in black and then offset slightly in gold embossing powder to create the shadow effect. I then added a little more shadow underneath with black watercolour pencil. As you can see, the embossing didn’t quite take on the edge of the patterned paper so next time I’ll emboss the image separately and then cut out and attach. I wanted to include this card though because I really like the gold embossing on the edges of the patterned paper. To do this I ran the edge of the paper along my clear ink pad and then dipped into the embossing powder to get this cool, rough look. 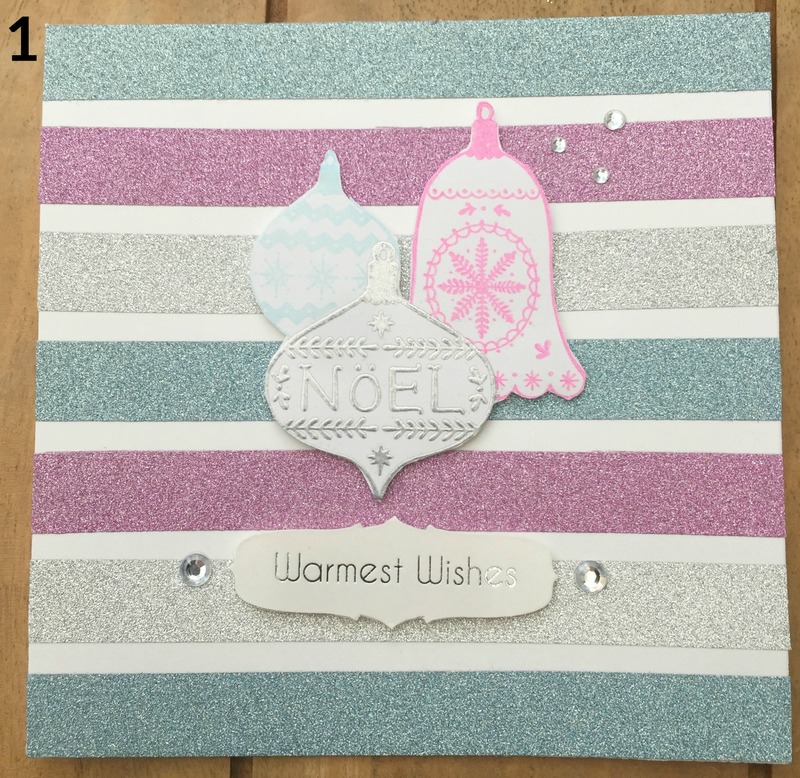 For these two cards, the background stamping is the star. I don’t have any specific background stamps in my stash yet so I just repeat stamped some smaller images. For the first card I used a holly stamp, and added the berries with a red Sharpie. 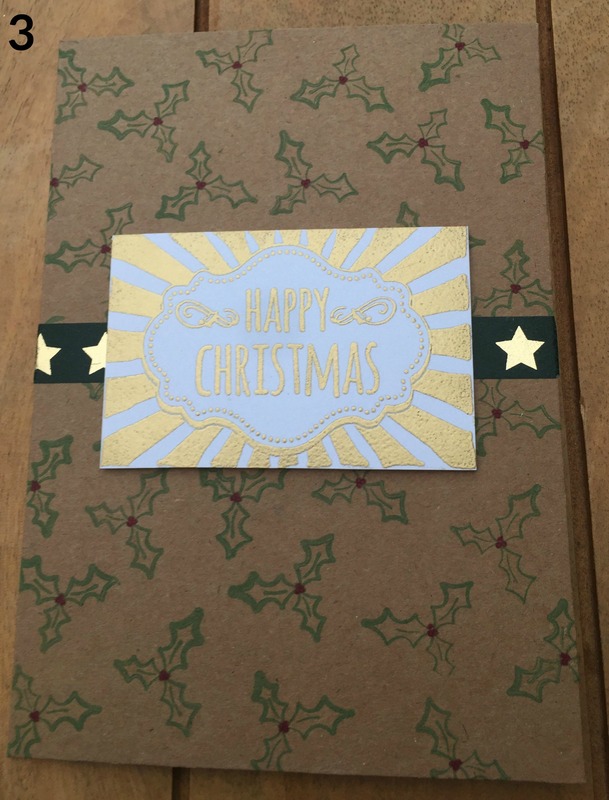 Then added the green star washi tape as a banner and cut out the Happy Christmas tag stamped image, embossed in gold. 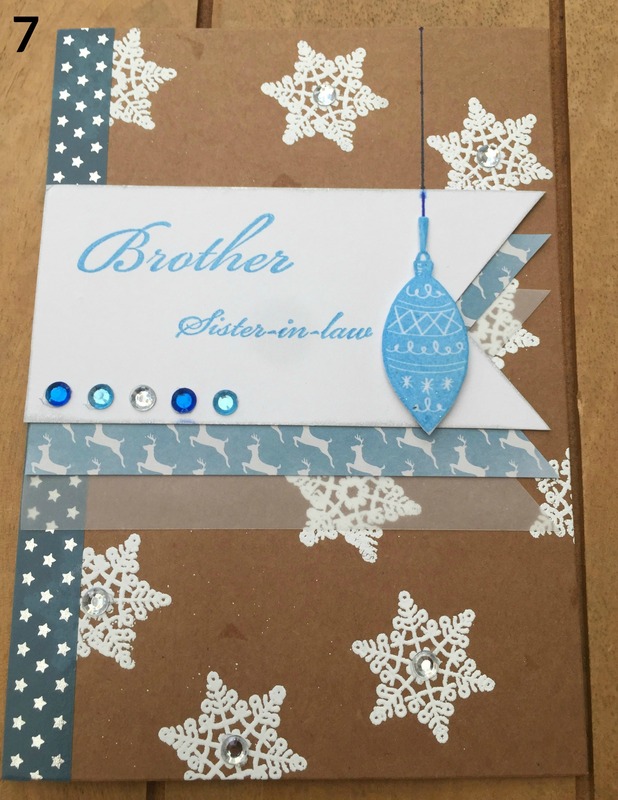 The background of the second card was created using a combination of snowflake stamps and embossing powers – clear gloss, opaque white and glitter gloss. 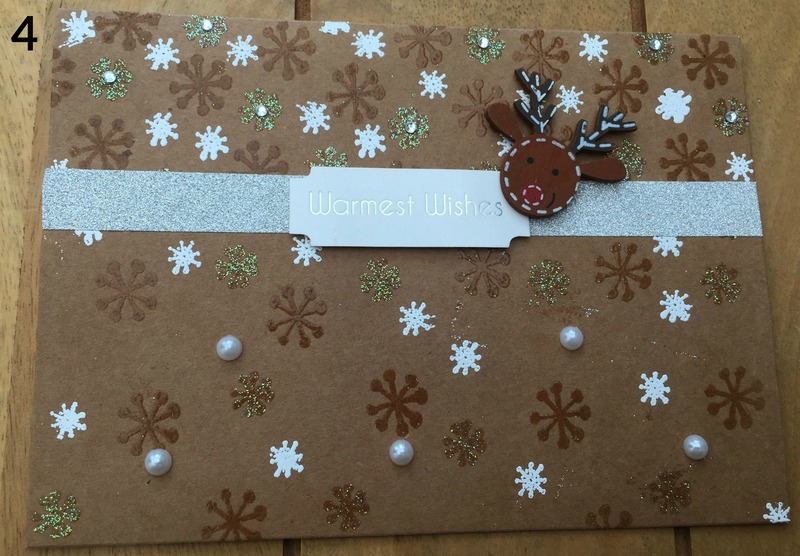 I used the same tape and greeting banner as the first card, finished with this adorable Rudolph embellishment. These are more time consuming but really fun and there are lots of options for what you put behind the window. I bought specific window card stock for ease, but you could cut out your own. I did the same holly leaf background as above and also edged the window in red ink to make it stand out (I do this by running the edge along my ink pad, I use these really tiny coloured ink pads which makes this easier. I created a separate panel for behind the window and made sure I lined up my stamped sentiment with the centre of the window. I attached an acetate sheet to the back of the front of the card, carefully added some glitter before adhering the sentiment panel. I did all this with foam tape for dimension and so the glitter has room to move around (make sure you don’t leave any gaps in the foam tape or else the glitter will spill out). You can add all kinds of things to window cards including sequins, gems or even small embellishments or stamped images. This card was the quickest and easiest to make but one of my favourites. 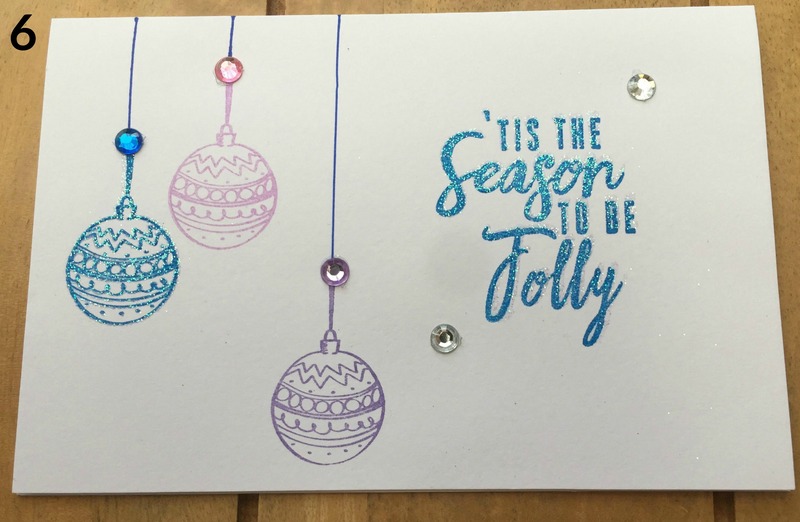 I used repeat stamping in various shades for the baubles, I used a Sharpie pen in a coordinating colour for the strings and finished off with glitter embossing on the sentiment and one image, plus a few crystal stickers. I used this triple-layer banner to make the focal point on this card; white cardstock, festive patterned paper and vellum for the bottom layer for a bit of variety. I created the glossy bauble image using the same technique as on the washi card above and created the background using a larger snowflake rubber stamp, white embossing powder and crystal stickers. Some people prefer the rubber stamps to the clear but I find they can create an unwanted edge which is annoying. Again, this is one of the most simple cards but a real favourite. 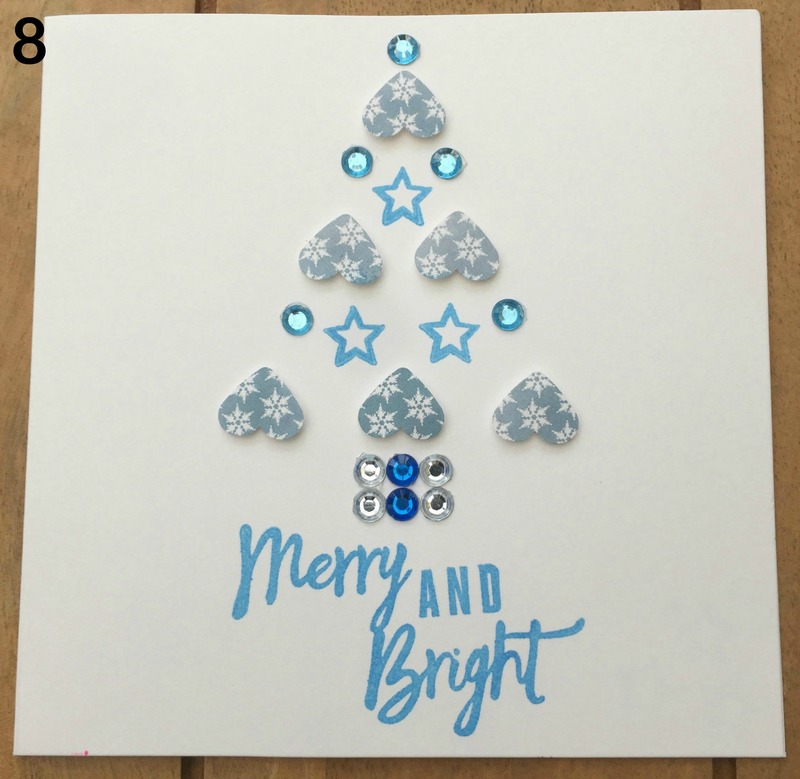 This is my version of this Pinterest image, using a heart punch, patterned paper, blue crystals and a tiny star stamp to create a modern, Christmas tree shape. 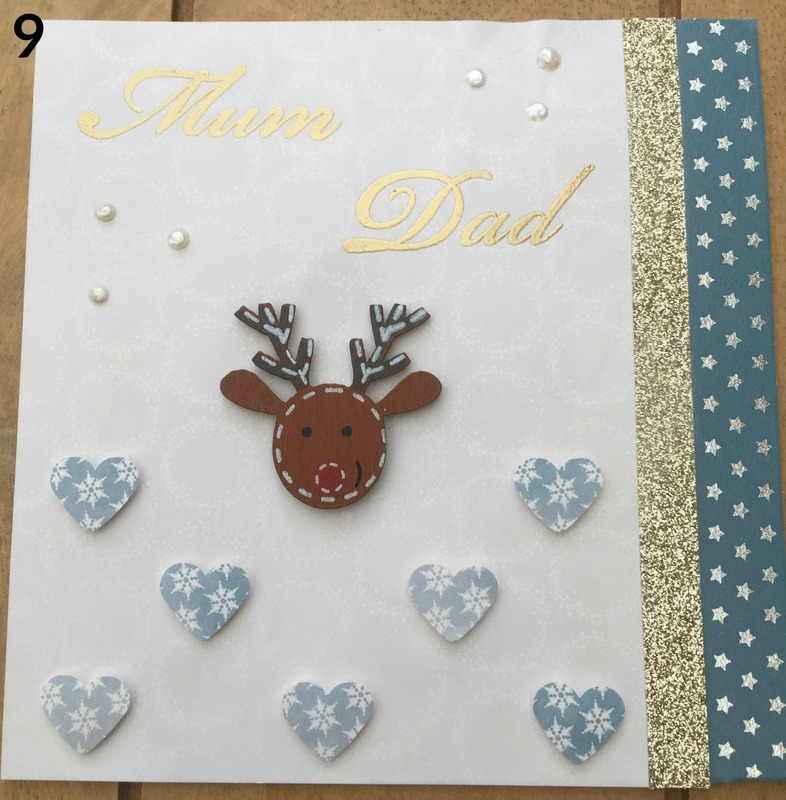 You can buy so many beautiful embellishments, which make card making really simple. The Works have got lots of festive images at the moment and so reasonably-priced. I’ve used this reindeer as the focal point and finished off with punched hearts, washi tape and relative stamps. This was my first time using 3D Pearl Effects; this is a liquid that comes in a variety of pearlescent shades that hardens to look like pearl embellishments. As you can see I need a bit more practice with this! For this one, I’ve covered the entire card front in one of the plainer pattered papers to give a watercolour effect, and then stamped, embossed and embellished on top. I pick up many of my supplies from The Works because they always have a good variety and, with prices from only £1, the value for money is brilliant. I’m giving away a £20 giftcard for The Works below, plus two second prizes of this Folk Christmas clear stamp set. Disclosure: This is a collaborative post with The Works. Words, opinions and designs (except where mentioned) are all my own. Previous Previous post: Can Creativity Encourage Good Mental Health? I’d just get glitter every where! ‘Hopping over from PoCoLo… I am currently co-hosting a linky party “Wrapping up the Holidays”. If you have time, this would be a perfect post to add to the party! Such beautiful cards. Thanks for sharing this blog post. I love the Works for their craft supplies, so affordable.